A few days ago while walking around I noticed there was a lot of paper floating around, caught up in the grass on the side of the road. I grabbed one and realised what it was — death money. It was then that I saw at a nearby neighborhood temple that there was a funeral procession going on. In Chinese culture the families of the deceased burn fake money, and many, many other things, for them to use in the afterlife. This note that I grabbed was for ¥50,000,000… hope it’s enough for the Hell Bank! I wonder, are these notes to buy your way out of Hell? 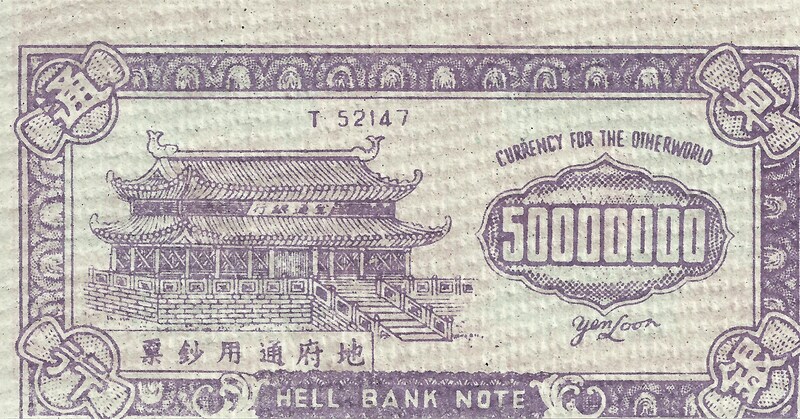 Why is it a ‘Hell Bank Note’ instead of a ‘Heaven Bank Note’? Do you not need any money in heaven?